Twins outfielder Byron Buxton fits a young fan with a new glove. Twins infielder Eduardo Escobar (center) signs an autograph for a fan at Sibley Park in Northeast Minneapolis. 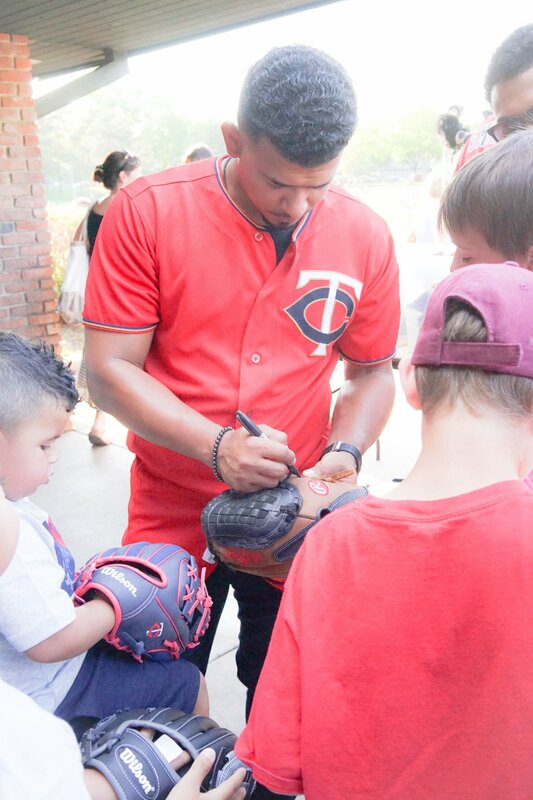 Twins centerfielder Byron Buxton and infielder Eduardo Escobar took a recent day off to hand out new gloves to youth in Northeast Minneapolis. Kids by the hundreds came out to Sibley Park in Minneapolis on May 16 to meet the Twins stars and get new gloves courtesy of the Twins and the Minneapolis Parks and Recreation Board. In support of the Twins RBI (Reviving Baseball in Inner Cities) partnership with the Minneapolis Park and Recreation Board and St. Paul Parks and Recreation, the Twins Community Fund purchased brand new Wilson gloves for every player in the 8-and-under division of the RBI league. With support from Pitch in for Baseball, the Twins RBI program will distribute more than 3,000 gloves to kids ages 8 and under in 2018. Reviving Baseball in Inner Cities is an international initiative of Major League Baseball and its clubs. The Twins RBI program is operated in partnership with MLB, Twins Community Fund, Minneapolis Park and Recreation Board and City of Saint Paul Parks and Recreation. Since 1993, the Twins Community Fund has contributed nearly $2 million to the Minneapolis Park and Recreation Board and City of Saint Paul Division of Parks and Recreation to operate leagues in their respective city. Along with operating funds, the Twins Community Fund also grants money to each city to assist with the creation and renovation of ball fields. The program serves nearly 6,000 youth in the Twin Cities.